If the end user require third party inspection for copper nickel pipe fittings , it is available. Lots of third party inspection organization have inspected our copper nickel pipe fittings and other products, Such BV,SGS,ABS etc. 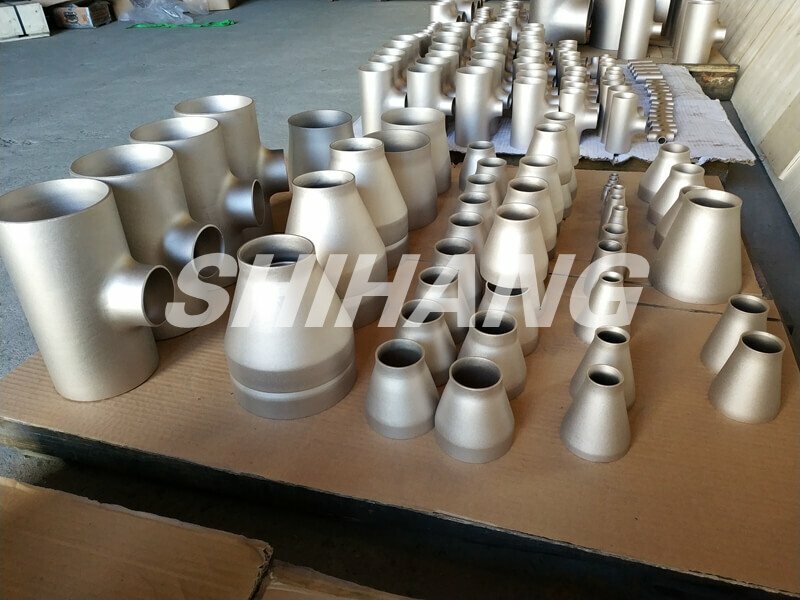 Shihang exported copper nickel pipes fittings , pipe and flanges for more than 10 years and no any complaint from the end user. 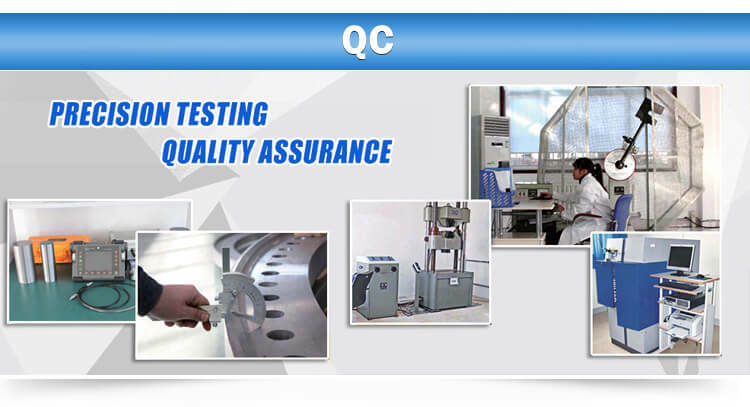 We have own testing laboratory and strong ability of QC. Each order , our mill test certificate as per EN 10204 3.1 will be issued with the copper nickel pipe fittings. Confirm our copper nickel pipe fittings are totally meet your requirements. 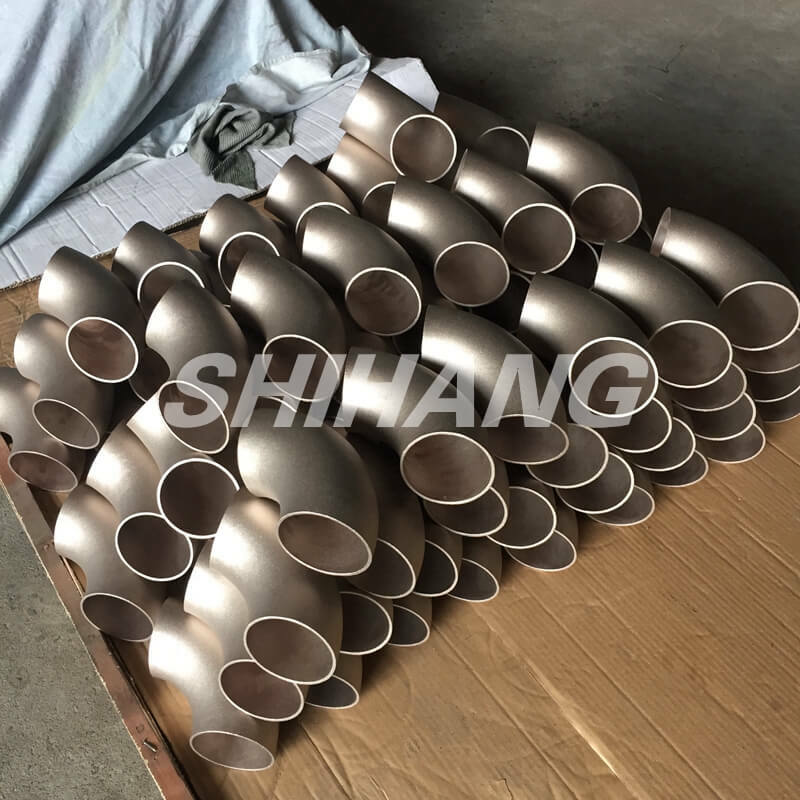 Shanghai Shihang is one of the most professional copper nickel pipe fittings manufacturers, which has specialized in producing of Copper-Nickel pipe fittings, flanges and pipes for more than 20 years. 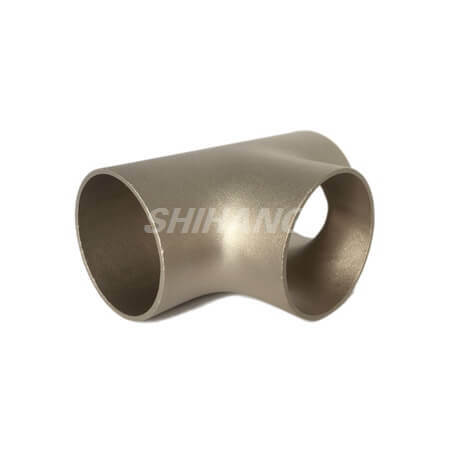 Among other Copper Nickel Pipe Fittings suppliers, Shanghai Shihang offers the excellent quality of economic price to their clients worldwide. Copper nickel pipes , copper nickel flanges and copper nickel pipe fittings forms a very good copper nickel pipe system. 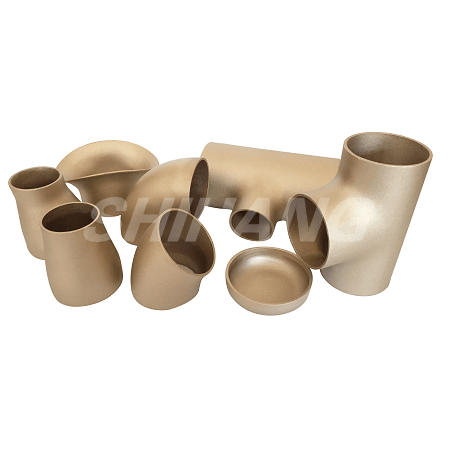 Copper nickel pipe fittings can be also named as cuni fittings and cunifer fittings. 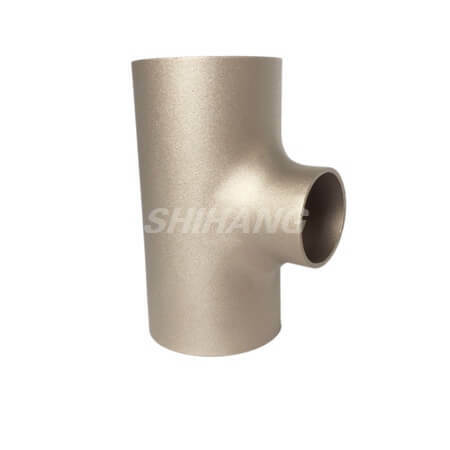 Shihang copper nickel pipe fittings have the good chemical composition, perfect mechanical performance. 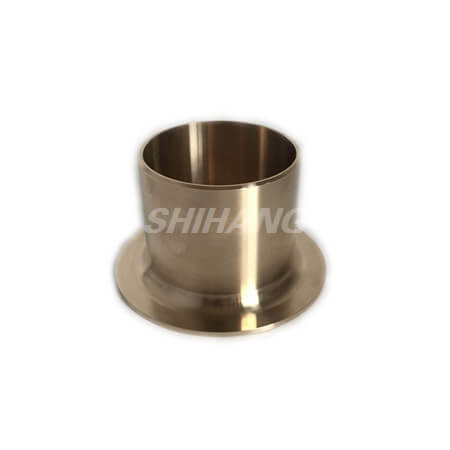 Shanghai Shihang carries an extensive inventory of pipe fittings in copper-nickel. Copper nickel pipe fittings play the crucial role in repairing or installing copper nickel piping fitting systems and mechanisms. Through copper nickel pipe fittings, different materials include gas, liquid, and other occasional solid substances can quickly pass through to the object. 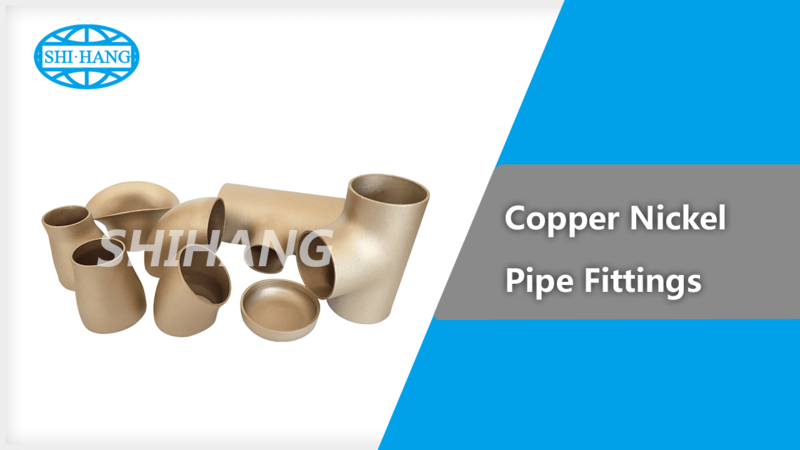 Copper-nickel pipe fittings ensure solid tubing and tough pipe dressings to avoid any leakages. DIN standard copper nickel pipe fittings are most common standard in shipbuilding. The pressure rate in DIN is 10 bar and 14 bar. Material: it can be named as CW352h and Cuni10fe1.6mn. The DIN standard material requirement like tolerance is stricter than other standards. EEMUA 146 standard copper-nickel pipe fittings are normally used on the marine and offshore structure. The pressure rate in DIN is 16 bar and 20 bar. ASME B16.9 standard flanges are mainly used on the oil field , offshore desalination plant , FPSO and so on. Thickness: Sch5s, Sch10s, Sch40s, Sch80s. For copper nickel pipeline , copper nickel pipe fittings is an important part. There are six main copper nickel pipe fittings component. Copper nickel elbows ( cuni elbow ) are a type of 90-10 copper nickel pipe and fittings used for changing the flow direction. the demand copper nickel elbow is the largest. It can be about 80%. 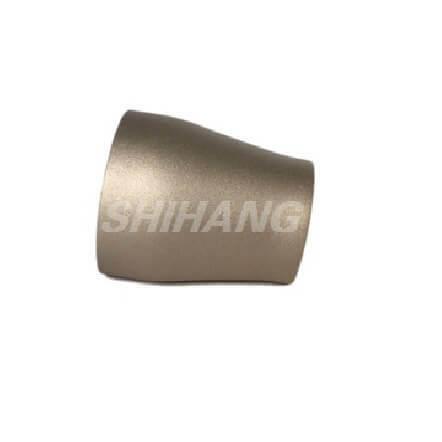 Shihang, as a copper nickel fittings supplier , also produce the copper nickel elbow. 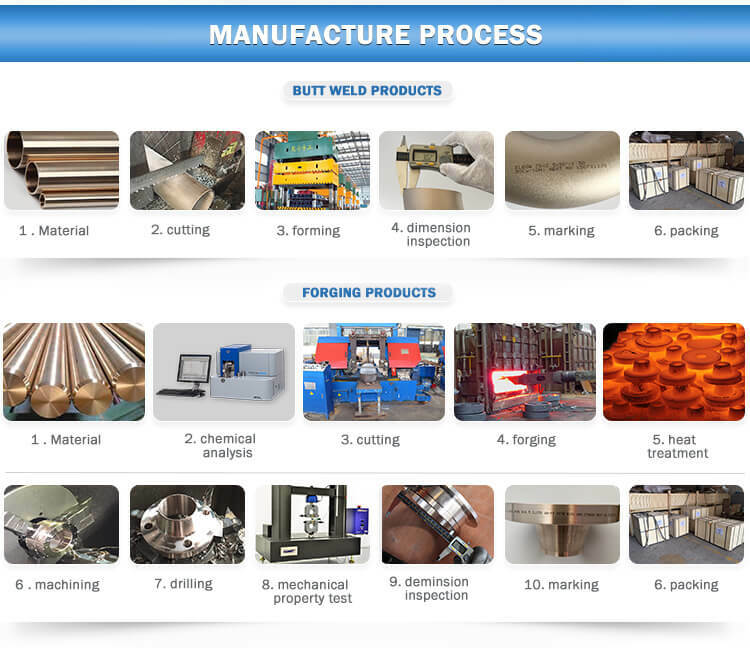 Different forming processes are used for different materials or wall thickness elbows. Copper nickel pipe fittings manufacturers commonly used seamless elbow forming process hot push hydraumatic or clod forming method. The most common application is copper nickel elbow shipbuilding. If the outer diameter is more than 457 mm , it should be welded. 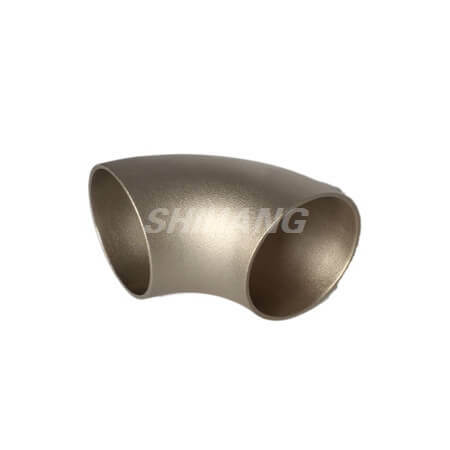 Copper nickel tee is also one of the copper nickel pipe fittings. It is mainly used in the main pipe branch pipe. Copper nickel tee is divided into the equal tee and reducing tee. For copper nickel seamless tee, the main processes include hydraulic bulging and hot-press forming. 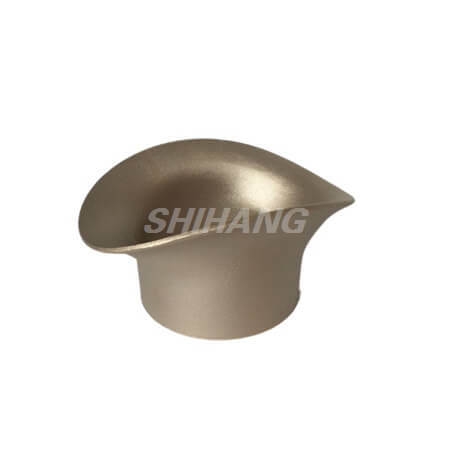 Shihang, as a copper nickel fittings manufacturer ,is also a china copper nickel tee manufacturer. Copper nickel reducer is one of the common copper nickel pipe fittings. It is used for the connection of two different diameters copper nickel pipes. they are divided into concentric reducer and eccentric reducer. For seamless copper nickel reducer , outer diameter is less than 419 mm. 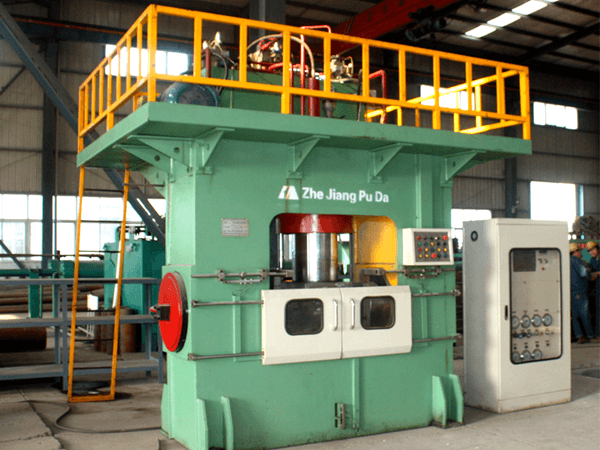 The commonly used forming process is shrinkage-reducing, expanding-diameter pressing. Reducing the forming process of reducing joints is to put the tube blank with the same diameter as the major diameter of the reducing joint into the forming die. By pressing along the axial direction of the blank, the copper nickel pipes moves along the cavity and shrinks and forms. According to the size of the reducer, it can be divided into one press forming or multiple press forming. For seam welded copper nickel reduer , outer diameter is over than 457mm. We use copper nickel plate to roll , and then welded. The reducer used for ventilation and dust removal pipes is welded after the steel plate is rolled. Copper nickel saddle is an alternative to the copper nickel tee. It has strong flexibility of use and is well received by domestic and foreign markets. The advantage is large diameter change and wide range of diameter change. The copper nickel saddles welded with copper nickel pipes. The functions are same as copper nickel tees. Copper nickel end cap is welded in the pipe end or installed in the pipe end of the external thread to cover the tube pipe fittings. Please kindly click here to download our Copper Nickel Pipe Fittings Catalogue. The applications of copper-nickel pipe fittings are widely used in different industries. Desalination plants: Such pipe fittings are commonly used in minerals and metallurgy projects where these copper-nickel pipe fittings dimensions guard piping mechanisms against water, sand, and defective soil ingredients. Shipbuilding: These projects are based on sea or river where pipe fittings play the decisive role to protect pipe systems from dangerous water substances. It also helps to put across the water and other solid stuff in vessels and pipes to the ships through tubes and pipes. Power Generation: The power plants rely on such pipe fittings and tubes where electricity can quickly pass through to the object. However, other industries where such copper nickel pipe fittings are widely used are seawater projects and hulls of ships and boats. Copper Nickel Pipe Fittings are resistant to water, salts and seawater dangerous substances. Copper Nickel Pipe Fittings are water-resistant and protects the copper-nickel pipe flanges from organic compounds, brine water, salt, dangerous acids with non-oxidizing diluted contents. Copper Nickel Pipe Fittings are used efficiently for seawater oil piping systems. Copper Nickel Pipe Fittings are durable and sturdy enough to avoid any leakages. Copper Nickel Pipe Fittings are easily to install, repair and fixed. Extend Product Lifecycle of piping systems and mechanism. Resistant to water, marine organisms, non-oxidant acids and other corrosive ingredients. Copper Nickel Pipe Fittings can perform proficiently under healthy caustic environments. Prevents antifouling substances to stick with the object. 1.2 The copper nickel alloy materials for manufacturing pipe fittings should be seamless copper-nickel alloy pipes. And their chemical and mechanical properties should satisfy the requirements of relative standards. 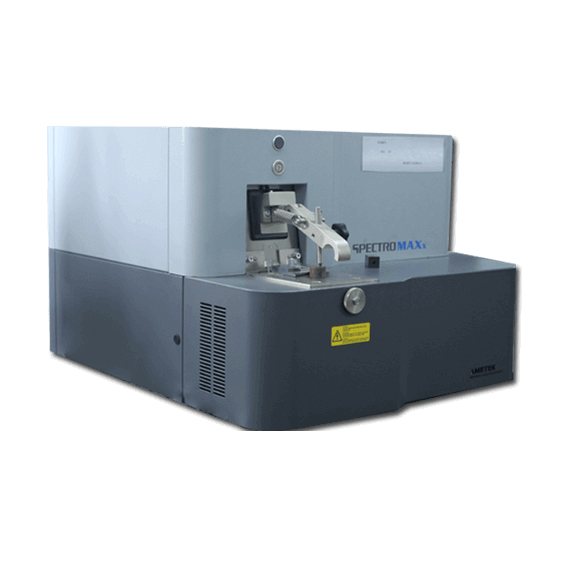 The inspection device for the chemical components is shown below. 1.3 The materials should come with quality certificates, the inspection items of which should satisfy the requirements of relative standards or the order. Materials with no markings, batch numbers or quality certificates, or with quality certificates with incomplete inspection items should not be used. 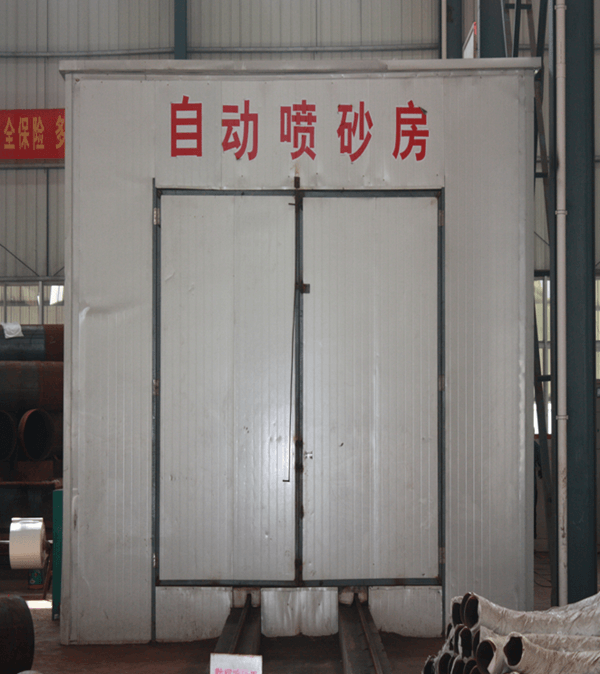 1.4 After the materials arrive at the factory, our company will inspect them according to the quality certificate before acceptance, and will conduct sampling inspections in terms of appearance, dimensions as well as physical and chemical properties. a) Opening the mould and inserting the workpiece covered by the lubricant into the guiding section of the cavity. 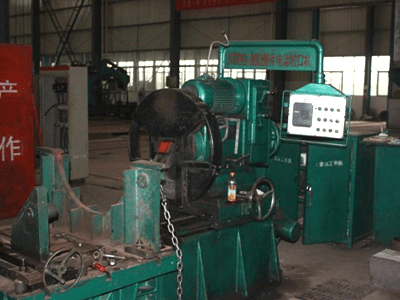 b) Pressing together the upper and lower mould through the hydraulic cylinder, and the pipe blank in the guiding section of the cavity will be pushed into the forming cavity by the side push cylinder. 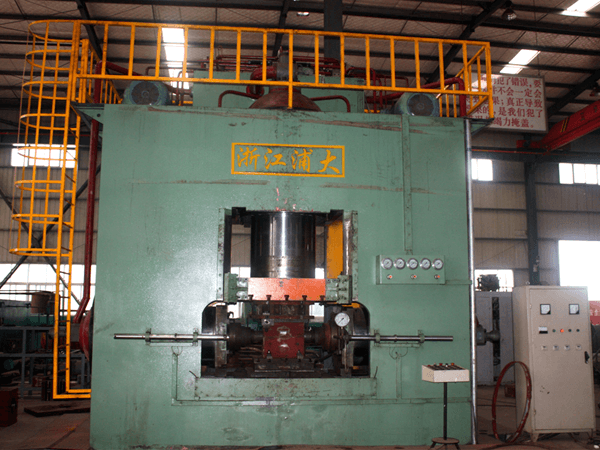 Below is the hydraulic press. 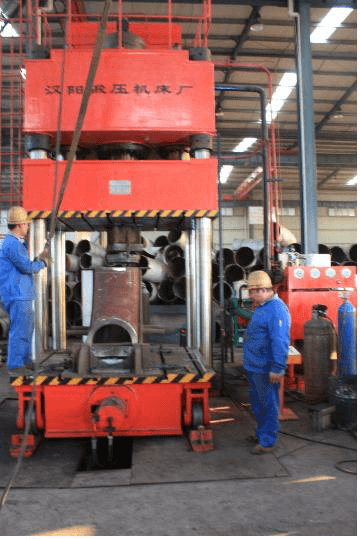 c) Adjusting pressure and conducting the one-time forming process of the pipe fitting. Cutting the domes on the branches through the band saw and leaving a machining allowance of 2-3mm on each end according to the dimensional standards for welding joints. Below is a tee cold forming hydraulic press and tee moulds. a) Heating temperature: 900~950℃ for steel alloy pipe fittings, maintaining the temperature for 1~1.5min/mm before leaving the oven. 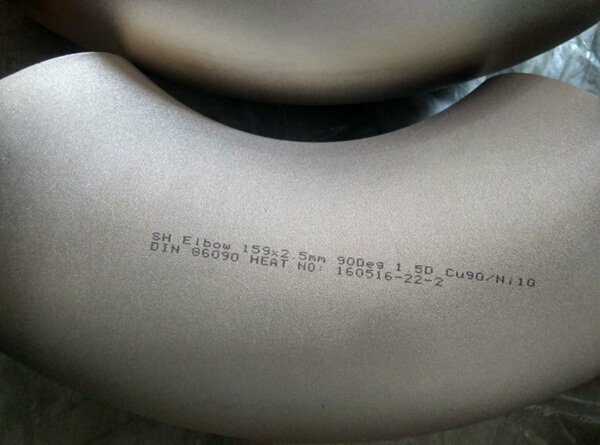 a) Heating Temperature: 850～900℃ for carbon steel pipe fittings, 900～950℃ for steel alloy pipe fittings, maintaining temperature for 1～1.5min/mm before leaving the oven. d) After heating the compressed pipe fitting should be lifted out of the oven and one side of the workpiece should be submerged and cooled down in the water. The submerged depth should be between half to two thirds of length of major axis of the compressed pipe fitting. 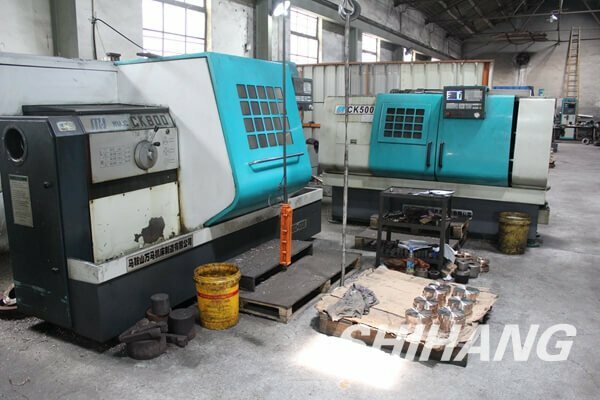 After being cooled down, the workpiece will be lifted onto the tee mould while the high temperature part should be placed below and the workpiece should be completely aligned with the mould. e) The upper slider of the hydraulic press moves down and stops at the configured position. f)Continuous observation is required during the pressing process and the press should be stopped when wrinkles are detected. g) Insert the pressed workpiece back into the oven and repeat step 4 and 5 after heating and maintaining temperature, until the upper and the lower tee moulds get together. a) Heating temperature：850～900℃ for carbon steel pipe fittings, 900～950℃ for steel alloy pipe fitting, maintaining temperature for 1～1.5min/mm before leaving the oven. d) Conduct pressure check before drawing operations. g) Insert the pressed tee back to the oven and repeat step 5 and 6 after heating and maintaining temperature, and then conduct the 2nd, 3rd, and 4th drawing operations. 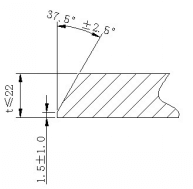 h) The maximum allowed pressure during the drawing process is 10MPa. i) The maximum allowed velocity during the drawing process is 50mm/min. Cutting according to the blanking layout. a) The blank is heated according to specific requirements, the heating temperature range is 850～900℃. Even temperature distribution is required for the blank and the temperature should be maintained for 1～1.5min/mm before the blank left the oven. 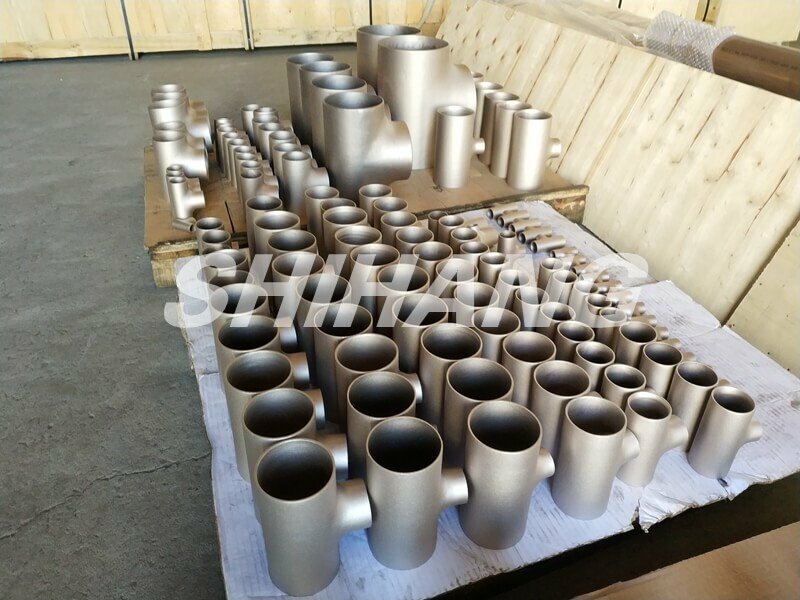 After the forming process, the end diameters of the pipe fittings should be inspected. 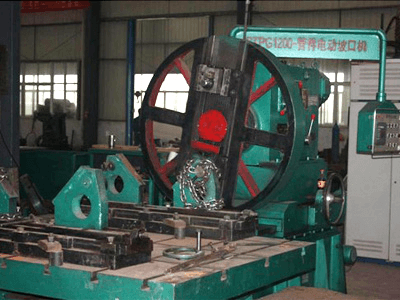 If the diameters are beyond the dimensional tolerance, then the ends should be shaped through the hydraulic press and the shaping mould. After the shaping process, the end diameters as well as the roundness should not exceed the allowed range of relative standards. After the forming process, the pipe fittings should be treated with normalization and tempering while heat treatment is not necessary for forged pipe fittings after machining. 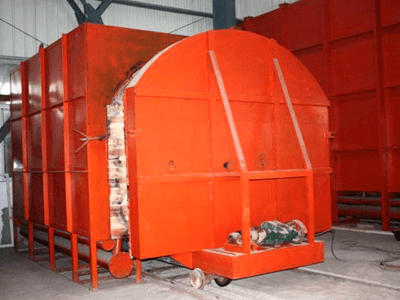 Figure 6.3.1 and 6.3.2 show the MTL-350 and MTL-2000 heat treatment oven, which are suitable for the heat treatment of all kinds of pipe fittings. The annealing temperature for copper-nickel alloy pipe fittings is 850 degree. The external surface of all pipe fittings should be inspected with a portable harness sclerometer. The inspected locations include the pipe bodies of the tee header and branch, welding seams and their heat-affected zones; the inner and outer elbow arcs, welding seams and their heat-affected zones; the top and end of the cap, welding seams and their heat—affected zones; the bigger and smaller ends of the irregular connectors, welding seams and their heat-affected zones.3~5 points should be selected on each location for inspection and the average value is selected for the hardness inspection report during production. 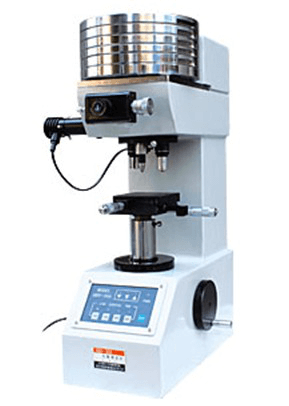 The hardness inspection equipment is the Brinell hardness tester shown in Figure 6.4.1. The welding joints of the pipe fittings should be formed through machining. The dimensions of the root faces and the angles of the joints of pipe fittings produced according to the ASME B16.19 standards, should satisfy the requirements in Figure 1. The joint machining equipment of our company are 7 beveling machines for machining joints, some of which are shown in figures below. Before the non-destructive testing of each copper-alloy pipe fitting, the mill scale and other dirt should be removed from the surface of the pipe fitting through methods such as sand blasting and polishing in order to ensure that the surface roughness satisfies the requirements of MT, UT and RT inspections. 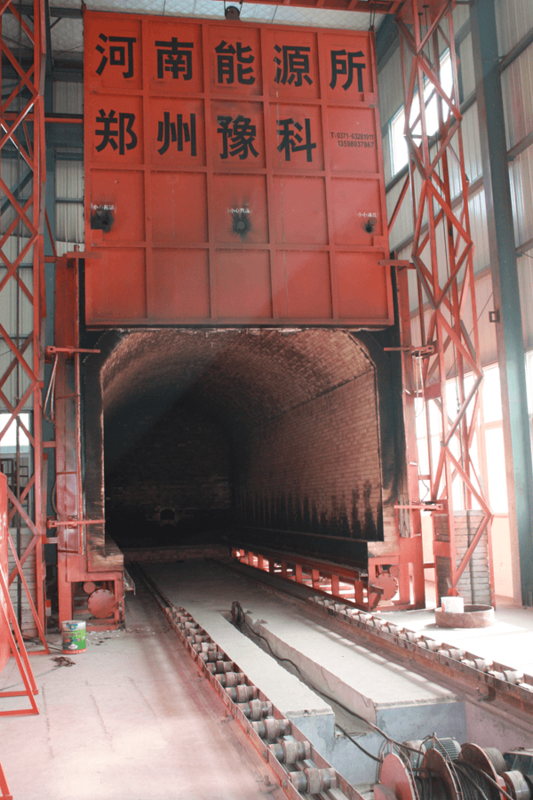 Below is the automatic sand-blasting room of our company. 1.The surface of pipe fittings should not contain cranks, overheating and over-burning defects as well as hard spots. 2.Pipe fittings should have smooth inner and outer surfaces, and should not come with strength or appearance defects, such as scabs, scratches and laps. 1.The sharp notches, gouge marks as well as other scratches that may lead to significant stress concentration should be polished and rounded. After polishing, flaw detections should be conducted on the polished locations through penetrant inspection or magnetic powder inspection in order to make sure that defects are eliminated. Thickness measurements are then conducted on the polished locations thought he ultrasonic method in order to make sure that the remaining wall thickness is no less than the requirements on 8.1. Smooth, isolated circular bottom marks cannot be repaired through polishing. 2.Any defects on the pipe fittings cannot be repaired through welding. 3.Patch welding of seams should be conducted with low-hydrogen welding materials, the strength and ductility performance of which should satisfy the relevant standards, before the heat treatment. 4.Before patch welding, defects should be eliminated through appropriate methods. And the non-destructive testing according to the requirements of 10.4 should be conducted after patch welding. A certain defect can only be patch welded twice. The packing list should include the company seal of our packing department as well as the packing date and signature of inspector. Specified inspection and testing results. Normal Marking: Size , Materials , Standard , Heat No.. You can also contact us for customized marking. Packaging: Shihang emphasis on the packaging to ensure that there is no damage during transportation. Copper Nickel pipe fittings are packed in seaworthy wooden case. Please kindly check, if you have any other technical problem , you can also send you problem to our e-mail: info@shshihang.com. Our engineer will reply you within 24 hours. 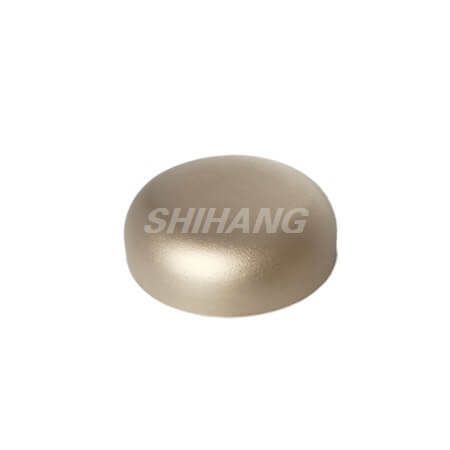 Shihang , as one of the world class copper nickel fitings manufacturer and supplier, has a wide range stock of different standard. 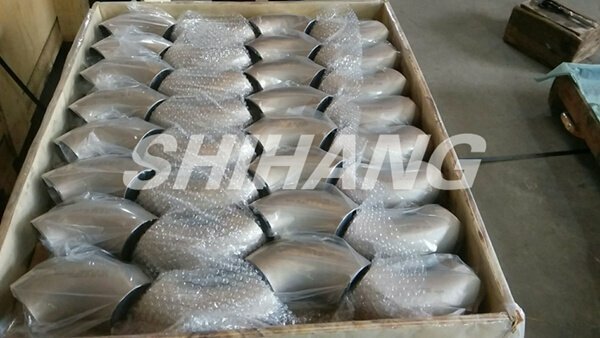 If the quantity is big enough , the non-standard customized copper nickel elbow , tee , reducer , end cap are also available. Any inquiry, please feel free to contact us. We will send you copper nickel pipe fittings quotation within 24 hours.